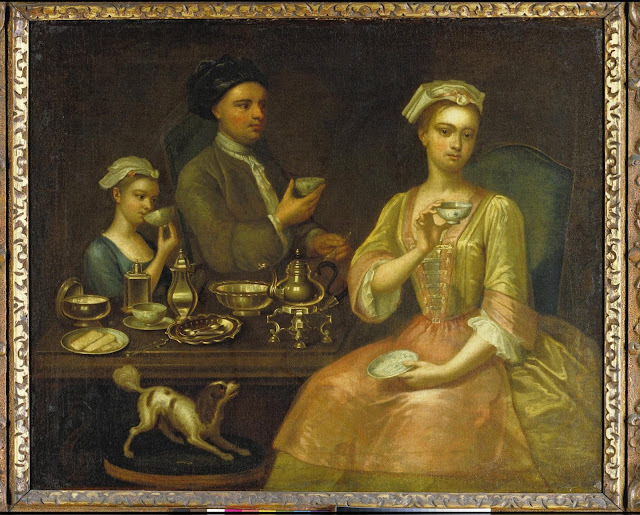 I was recently reading a bit of history on 18th century England and noticed a passage where the author mentions an aristocratic woman drinking a 'dish' of tea. It made me think of the post I wrote back in March about the value of 18th century teaware. I started researching tea bowls a little deeper, and somehow ended up down an ebay rabbit hole. A few days later I was the proud owner of a British tea bowl and saucer. I know, I shouldn't be allowed to have internet access; teaware just magically shows up at my door! The new teaware inspired me to learn more about British tea bowls, how they were constructed, and when the handle was added. Early European tea drinking gained popularity in the 1700s. England wasn't the first European country to sip tea, but it's where the beverage really took off, so I'm focusing on British teaware for this post. At first England imported its teaware from China because it was difficult to locally replicate the fine porcelain used in Chinese teaware. There were many pottery producers in England at the time, but they were unable to recreate the delicate Chinese porcelain. The recipe for Chinese porcelain was a well guarded secret. Softpaste porcelain began in about 1745 at Chelsea and within just a few years there were also factories at nearby Bow, Vauxhall and Limehouse...tea wares were amongst the first items to be produced and many of the pieces were decorated with oriental scenes, often copied straight from Chinese imports...Softpaste porcelains needed to be glazed as the body would otherwise be porous. To decorate softpaste, bowls were either left uncolored with molded flowers (this technique was called blanc-de-Chine) or painted blue and white. The blue decorations were commonly used because oxide of cobalt (the blue paint) was able to withstand the high firing temperatures. Other colors would be hand-painted or transferred onto the bowls and saucers after the first firing, and then fired again at a lower temperature. These colorful decorations were mixed with a lead base. The use of so much lead in the glazes led to many instances of lead poisoning for the potters working with the materials. Although the formula was eventually discovered at Meissen in Germany in the early eithteenth century, it did not reach Britain until about 1760, when an apothecary called William Cookworth found china clay (kaolin) and china stone (petuntse) in Cornwall and subsequently set up his factory in Plymouth...These two raw materials are essential to the production of hardpaste porcelain as made by the Chinese. Christina Prescott-Walker, a European ceramics expert and the director of the Chinese ceramics department at Sotheby's, believes the invention of the handle may have been a fashion statement more than a utilitarian choice. "In England, tea bowls were still being made as late as 1800," she tells The Salt. Faulkner writes in his book that the original bowls were perceived as more "authentically oriental" than their handled cousins. 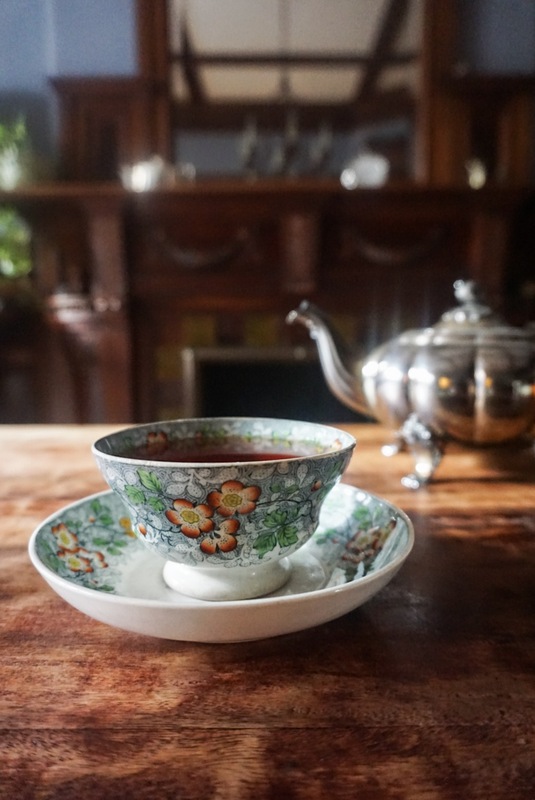 The tea bowl and saucer that I purchased online (pictured above and below) seems to be from the early 19th century, which certainly helps to prove this point. Cups became more ornamental in the late 18th century, and this could be when the addition of the handle really kicked in. The use of a saucer appears to be function over form. It may have been used to hold the bowl while drinking, and keep cups stable while serving tea to others. I also read articles where it's assumed the early saucers were more bowl-shaped (see my saucer in the picture above) because hot tea was poured into the saucer to cool, and then sipped. I had a difficult time finding proof of this, but it is mentioned in several articles. If you are interested in collecting antique British tea bowls, there are a few things to keep in mind. The earlier pieces usually did not have a maker's mark on them, so it can be difficult to pinpoint the factory it came from. The absence of a mark doesn't mean it's a fake piece. But even when you do see a mark, it's difficult to know where the bowl came from as many factories copied the marks and decorations of other well known companies. As I mentioned, sometimes sellers will mention if the piece is 'soft paste'. This is a good indication of the age of the piece (if accurate) as it's difficult to determine otherwise. Since it's difficult to truly know the age of a tea bowl unless you're really serious with your teaware collecting, just go with what appeals to you. In terms of style, there are many different ways the bowls would have been decorated: sets were either molded with flowers and left white (blanc-de-Chine), or could be fired with cobalt and then hand painted. Patterns were also transferred onto the pottery. This was done by etching or engraving the design to a copper plate, then inking the plate. A special paper was then applied to the plate until it absorbed the ink and was then transferred to the pottery. This is referred to as transferware, and it was used on my bowl and saucer seen above. In many instances you can see a very subtle seam on the design, where the ends of the paper meet. Transferware techniques are still used today, so it's not the best indication of the age of a piece. As you can see, I certainly learned quite a bit about British tea bowls! It has certainly given new fuel to my teaware collecting endeavors. For more on British tea history check out some of my older posts here and here. Is there a bit of tea history that you're eager to learn more about? Let me know what it is in the comments, and I will write a post all about it! So interesting! I too shouldn't be allowed internet access. Your post has already started me off searching.